The presence of uncontrolled flares anywhere in the hoof wall. So looking at the hoof with a short frog, it is usually the result of an upright pastern or clubby type conformation, where the heels are higher than normal and the heels are contracted and it is inclined to be flared at the toe. 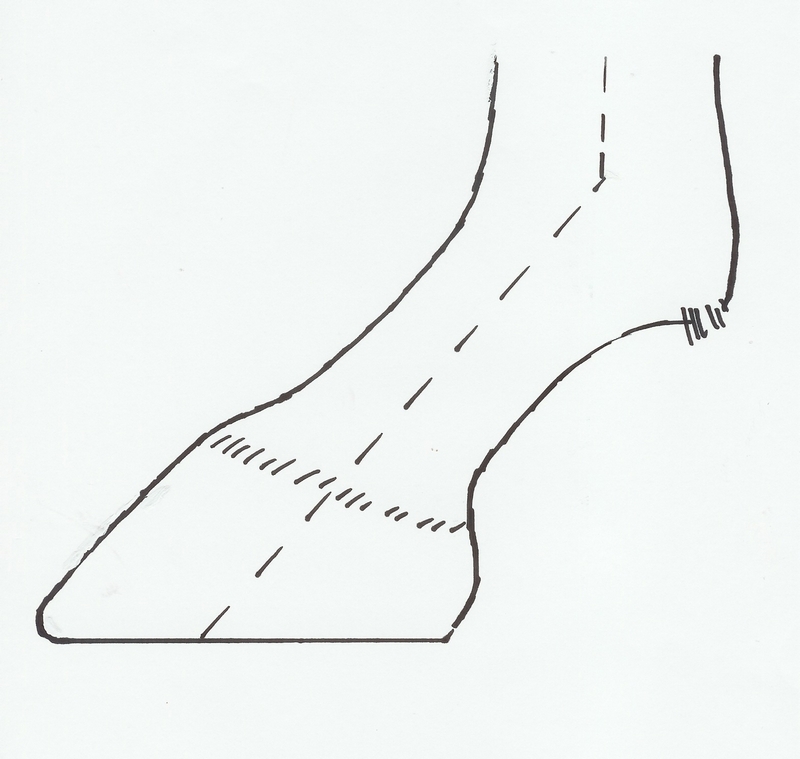 This toe flare usually results from trying to make this hoof look like the normal hoof/pastern parallel angle; in reality the short frog means that the tip of the pedal bone is further back from the toe and to achieve a balanced hoof this toe must be shortened, then the heels lowered to suit the 50/50 measurement in the bottom of the hoof. This correctly balanced hoof will not have a parallel hoof/pastern angle but will be clubby. Short frogs also occur from the effect of founder, because as the pedal bone rotates down and moves back from the toe the sole begins to drop and has the appearance of being convex instead of the normal concave. The exact opposite is the long frog and these are associated with the long sloping pastern conformation; often the active tip of the frog is not distinct and appears to be welded into the sole at the point. This type of hoof tends to collapse at the heels and become under-run. Soundness requires that the toe be shortened to relieve pressure at the heels or requires the fitting of a graduated shoe to lift the heels; this in turn alters the angle of the pedal bone alignment in relation to the pastern which in turn causes the tip of the pedal bone to move back and so too the tip of the long frog will move back and shorten, maintaining that 1 inch or 25mm relationship. It seems that as soon as these long frogs begin to shorten, the heel buttresses begin to stand back up to the normal heel profile and the long toes stop reoccurring; x-rays will show that the short pastern bone/ long pastern bone/ pedal bones are now in a correct line. 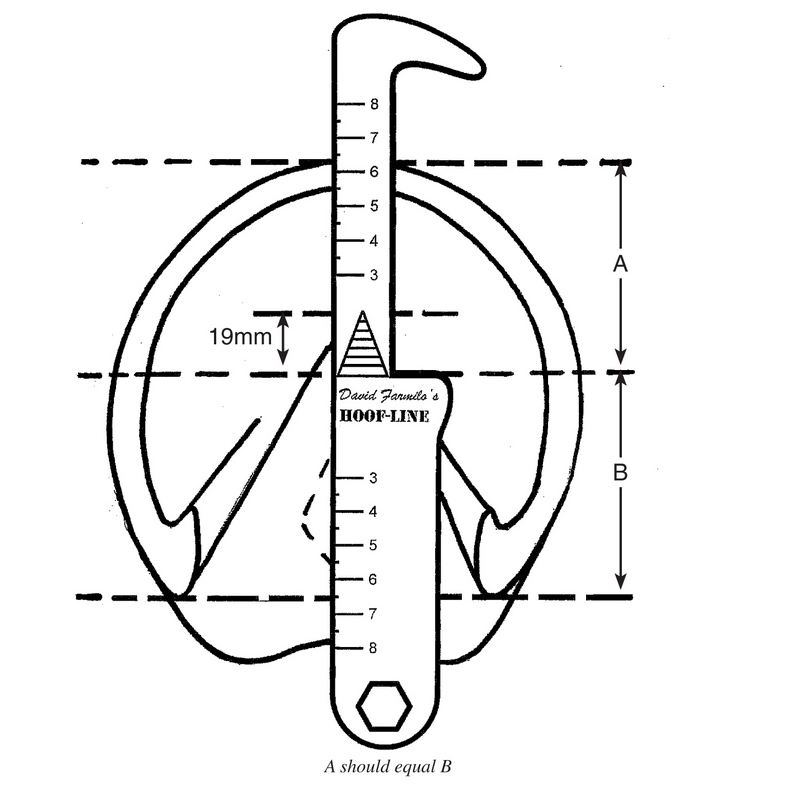 Looking at what appears to be a crooked frog, it needs to be understood that there is no such thing, and we are simply looking at a distorted hoof capsule which needs to be corrected and balanced laterally/sideways; or to put it simply, it is necessary to trim the hoof to achieve a T-square at the heels and to control the flares anywhere in the hoof capsule. (Pic 5) This out of balance hoof capsule is usually caused from a crooked leg conformation which results in distorted hoof wall – either toed out or toed in, splay footed or pigeon toed. When looking at a dissected hoof capsule, the frog positions itself in the centre of the underside of the pedal bone, which in turn positions itself under the ‘average’ centre of the leg bones; so in reality the frog is always where it is meant to be, and it is the hoof capsule that distorts, nor the frog. For example, if you put your size six foot into my size ten boot and stand on a slope, your foot will slide to the lowest point of my boot, and you will in effect have a flare left over in my boot. 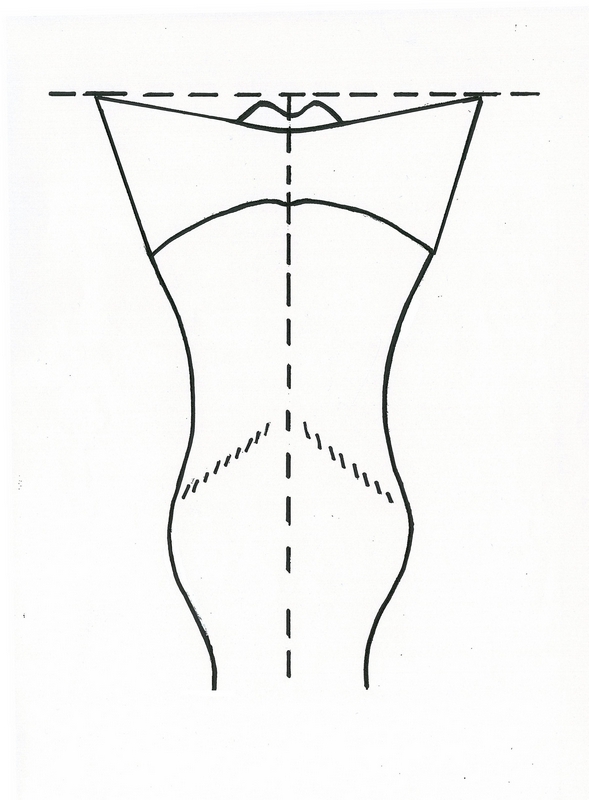 So using the external points of the visual frog, this medial/lateral imbalance can be corrected. Left misunderstood and uncorrected, long frogs, short frogs and crooked frogs will lead on to lameness which should have been corrected immediately if we as hoof carers are truly educated in our profession. 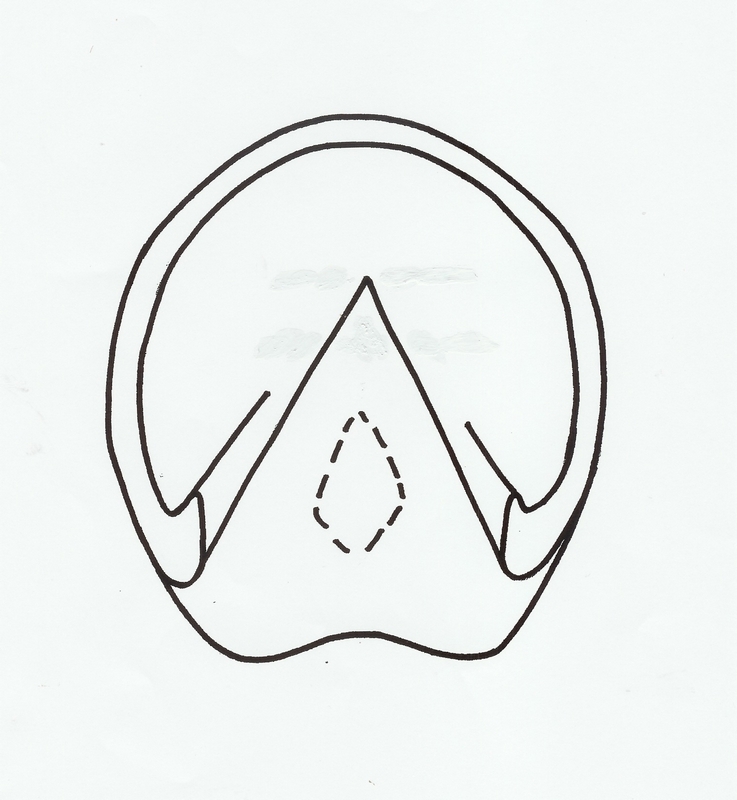 Previous PostPEDAL OSTEITIS – CAUSE AND EFFECTNext PostTHE NATURAL HOOF SHAPE and ‘RIGHT HANDED DISEASE’.